The archaeological site at Delphi is one of the most interesting sites in all of Greece. The site lies at the foot of Mt. Parnassus near the modern town of Delphi on the Greek mainland. Ancient Delphi was a prosperous area that was home to a powerful oracle (more about her later). The Delphi site perfectly balances the natural landscape with manmade monuments, creating a unique landscape that was perfect for ancient cults to develop. In Greek mythology, it is said that Zeus once released two eagles: one to the east and one to the west. The two eagles met at the center of the world, named “Delphi”, which means “womb” or “bellybutton” (depending on who you ask). In some stories, Delphi was the womb of Gaia, or Mother Earth, and a temple dedicated to her resided on Mt. Parnassus. A massive serpent, Python, guarded this temple. One day, Apollo came along and killed the serpent, claiming Delphi as his own. Apollo obviously needed people to worship him, so he fetched the Cretans and accompanied them to Delphi, taking the form of a dolphin. The Cretans began building a huge cult of Apollo in the area, and the sanctuary soon became the center of the Amphictyonic League. This “league of neighbors” was an association of 12 Greek tribes with major religious, political, and economic significance. In the 6th century BCE, the league reorganized the Pythian Games, which honored Apollos victory over Python. These games were held every 4 years, and were the second most important games in Greece (after the Olympics). As the center of the world, Delphi became an important economic hub, with many major cities placing treasuries on Mt. Parnassus. Delphi’s main claim to fame, though, is the Pythia. The Pythia was a high priestess at the Temple of Apollo who served as an oracle. The Pythia was considered to be the most powerful woman in the world between the 6th and 4th centuries. She was allowed to attend “male only” events like the Olympic games, own property, and was even paid a salary. Many Greeks believed that the oracle has existed since the beginning of time, with the first major account of her coming about in the 8th century BCE. The Pythia was known for her prophecies, many of which were related to wars. The Pythia was always a young woman native to Delphi who had to live a sober life and be of good character. The oracle would work for 9 months out of the year, taking the winters off. The Pythia would undergo purification rites once a month, which included fasting, before bathing in the Castilia Spring and drinking holy water. She would then enter the temple and sit on a golden tripod above a crack in the earth, where vapors would rise up. A sacrifice (usually a goat) would occur. The oracle would then breathe in the fumes and would go into a frenzy (which meant she was having a vision). Her visions would be interpreted by a priest of Apollo and relayed to the person who had paid for her services. If you have any free time, I really recommend looking further into the Pythia, as she was such an interesting part of Greek society! 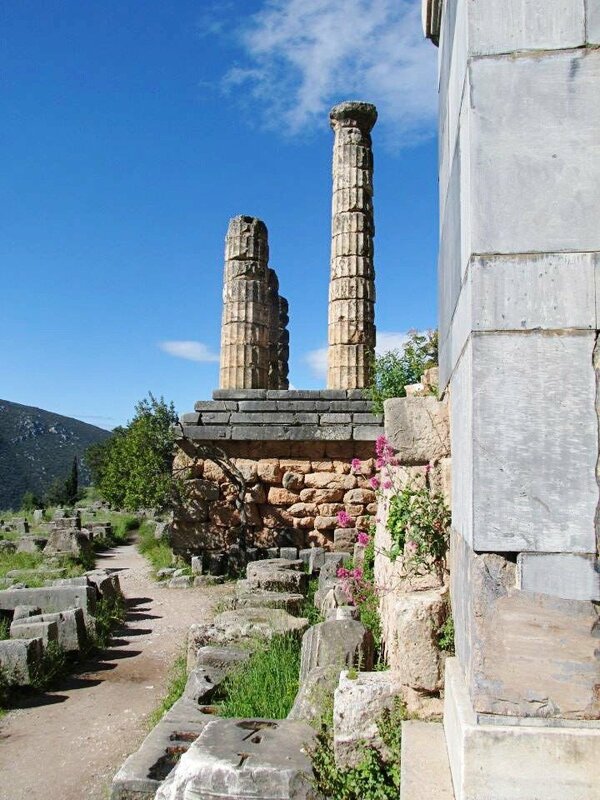 While exploring the archaeology site at Delphi, you’ll walk along the Sacred Way. The Sacred Way is a path that visitors to the oracle would have traveled to reach her. You’ll pass the Castalia Fountain, where all visitors to the oracle would have to wash before entering the Temple. You will also pass two treasuries. The first, the Athenian Treasury, has been reconstructed. The second is the Siphnian Treasury, which contained wealth from Siphnos (the island with many mines!). Finally, you’ll approach the Temple of Apollo, which is where the oracle once gave her prophecies. 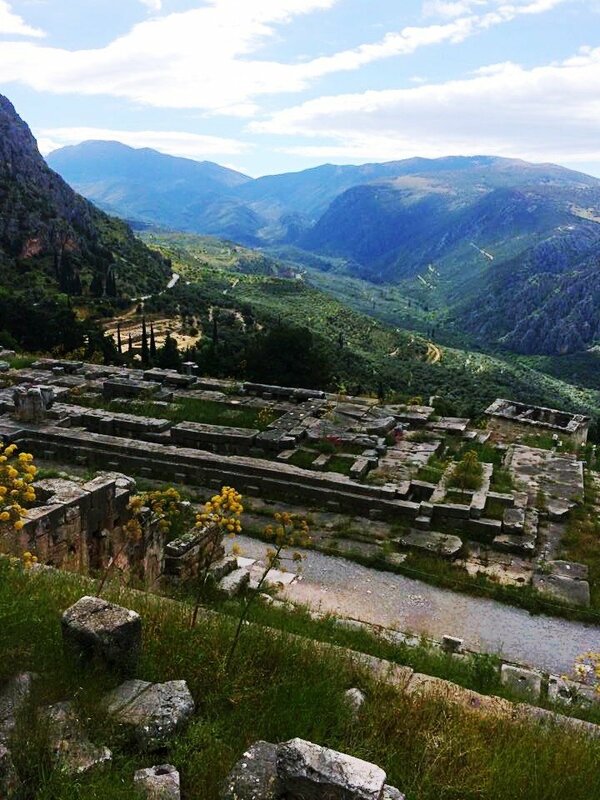 On up the mountain, you’ll be able to visit the Ancient Theatre at Delphi, the Stadium (or Stage) of the Pythian Games, and the remains of an ancient high school. 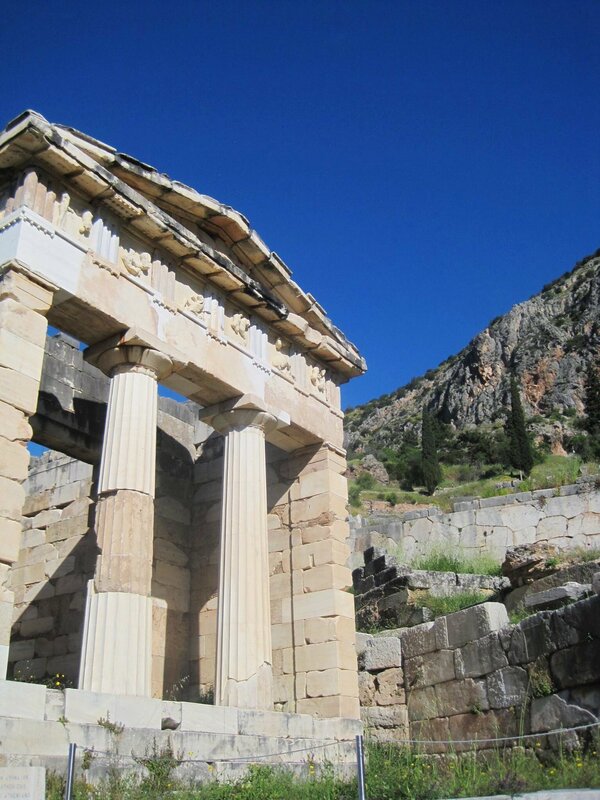 The easiest ways to get to the site are to walk or drive from the modern town of Delphi. The site is open from 8 AM to 6 PM. From April to October, entry to the site is €12. Entry reduces to €6 from November to March. Students can get in for free with appropriate identification. Entry includes access to the site and the museum! Wear sturdy shoes and be prepared to walk, and the site has some rough terrain. The view is killer, so plan to visit around sunset if you can time it right. Wear a light jacket, as it tends to get a bit chilly. Delphi is truly a magical place to visit and I cannot recommend visiting this site enough! PS: Want more Site Sunday reads? Check out these posts on the OFC Distillery, the Mines of Agios Sostis, Mystras, the Portara, and Delos! A millennial gal with a passion for archaeology, history, hanging out with my dog, and having epic getaways. Sometimes, these things overlap. Keep up with me to follow my experiences and maybe even get inspired.